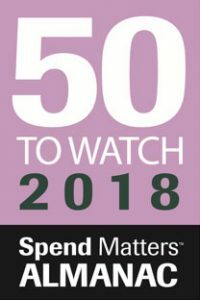 After months of debate, Spend Matters is excited to reveal the 50 Providers to Know and 50 Providers to Watch lists for 2018. At Spend Matters, we routinely review the latest procurement technology and service offerings. This uniquely positions us to help procurement organizations with their vendor selection processes. The 50 to Know and Watch lists are the result of intense debate, discussion and refinement among all of the Spend Matters analysts and reflect our unbiased, independent view of the providers you should have on your radar in 2018. Looking to learn more about the Providers to Know and Watch? View this free on-demand webinar featuring Pierre Mitchell and Jason Busch. 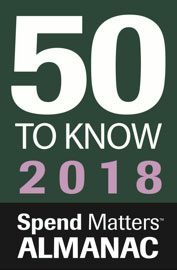 The Spend Matters 50 Providers to Know list for 2018 highlights leading technology and services providers that continue to raise the bar for procurement technologies and services. These are the firms that set the industry standard. The 50 Providers to Watch list shines a light on relative newcomers that are pushing procurement forward. These are the companies offering the latest and most innovative solutions in the industry. Visit the Spend Matters Almanac to access detailed provider listings for these and other providers. The Almanac is a vendor intelligence directory for modern procurement covering more than 24 categories and featuring more than 400 solution providers — including our unbiased reviews — and serves as a resource for anyone interested in our objective view of the procurement service provider landscape. TrustWeaver was recently acquired by Sovos. Thank you again.